Tell Sec. 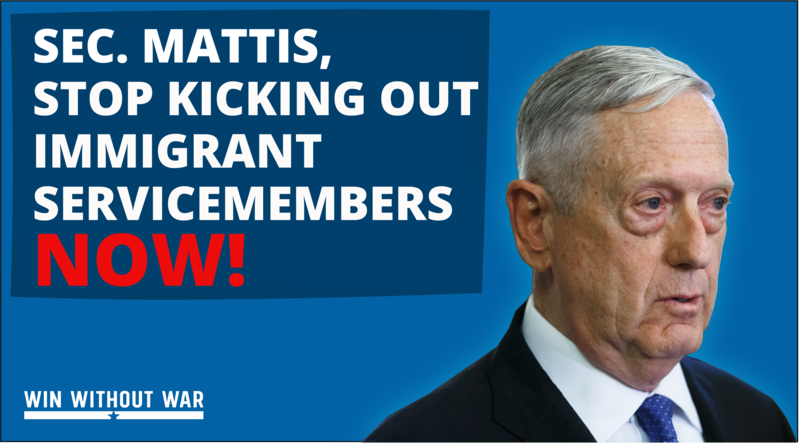 Mattis: Stop kicking out immigrant servicemembers! When immigrant recruits signed up to work for the United States military, they were promised a pathway to U.S. citizenship. Today that promise is being broken. We must hold those violating this basic promise accountable, starting with Secretary of Defense James Mattis. Sec. Mattis must investigate why these 40 immigrant servicemembers were ousted, and immediately halt all future discharges. There is no excuse for the U.S. military to go back on its word. You must halt any further discharges of immigrant servicemembers and launch an investigation into the unexplained military discharges and canceled contracts. There is no excuse for breaking the promise of a pathway to citizenship for those serving the United States.